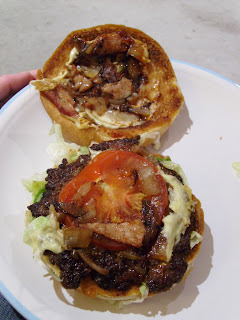 After posting about Pappa's Fish and Chips last year I received a couple of suggestions in the Comments to go beyond their namesake offerings and try the burgers. Firstly, let me say that we are blessed in Melbourne with accessibility to cheap burgers (eg Fishbone and Danny's) that aren't unrecognisable as food . I'm happy to add Pappa's to that list. The burger was not extraordinary, but given it was less than $6 it's an achievement. The good news starts with the condiments. There are two types of sauce: mayonnaise on the top bun and BBQ on the bottom. The pattie looked interesting (that's not a euphemism, it tasted fine!) - it looked like it had been chargrilled and blackened, but I think it was just some rogue onion or sauce that had spent a while near the hotplate. As is so often the case, the tomato left something to be desired, starting out soft and progressing to mushy. More good news: there's smoky bacon, there's non-plastic cheese and there's crisp lettuce. The single pack now has competition!